Guta Blas (1924-2008) was born in Guta Blas (1924-2008) was born in Łódź, Poland. Her father, Noach Blas, owned a textile factory and was able to send Blas and her younger brother, Moshe, to private Jewish schools. By 1940, Blas and her family escaped Łódź, which had been occupied by the Germans in September 1939, and fled to Starachowice-Wierzbnik, Poland, where Blas's mother, Bleema Goldwasser, had relatives. Blas and her parents were forced into the Tartak work camp in Starachowice, where Blas met her fiancé, Leon Weintraub, a fellow inmate. 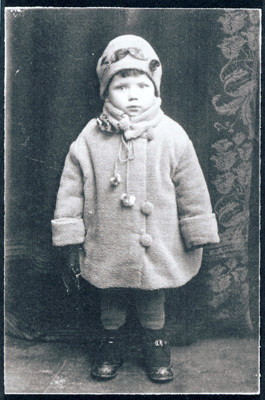 Guta Blas wearing a coat her father designed for her, circa 1926. Noach Blas, her father, was a clothing manufacturer and had a factory in Łódź, Poland.